What ways can you use the dice you just rolled? What numbers multiply to 24? How can you use the color scheme to check? Why might it be better to move backward than to move forward? 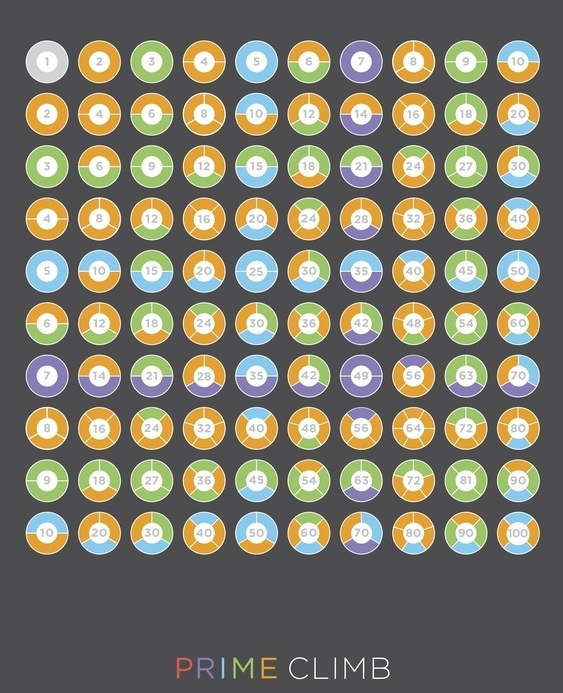 The game board for Prime Climb is a spiral of numbers from 0 to 101. The goal of the game is to get both your pawns to the space in the center, marked 101. In order to do this, you roll two 10-sided dice. You can then use these numbers to either add, subtract, multiply, or divide your way up the board. So let's say you have a pawn on space 6 and you roll a 3 and a 5. You can multiply 6*3 to get 18, then add 5 to get 23. Or you could add 6+3 to get 9, then multiply by 5 to get 45. Or, for some reason, you could subtract 5 and then add 3 to move backwards to 4. Whatever you want! Also, since each player has two pawns on the board, you can split your moves between the two pawns. There is one additional wrinkle to the game that makes it really interesting: If you land on a red space (a prime number greater than 10), you get to draw a card. These cards have special powers that you can use, so they are to your advantage. So while your overall strategy is to get to 101, your short-term strategy involves landing on a prime number space. There are a couple more basic rules that are on their website. I'll be honest, the game went much smoother once I watched this instructional video. It's quick and runs through some common scenarios you and your kids might encounter. 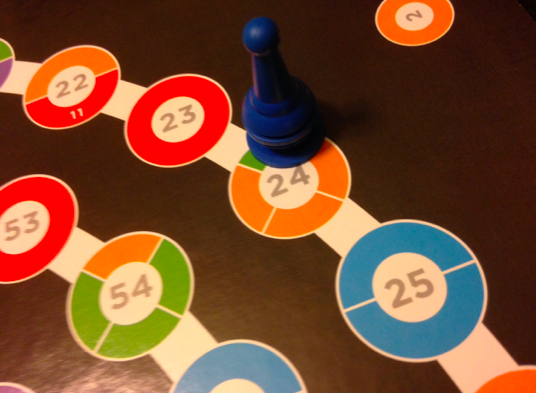 Let's start by looking at the colors of the first twenty numbers on the board. What do you notice about the colors? What do you wonder? Here are some things I notice: All the even numbers are orange. The only numbers with purple are 7 and 14. And all the multiples of 5 have some blue coloring. That's it! The coloring of the number indicates the factors of that number! The number 10 is orange and blue because it is divisible by 2 (orange) and 5 (blue)! Similarly, the number 12 is orange, orange, and green because 2*2*3 gets you 12. So the coloring of a number indicates its prime factorization, the set of prime numbers the multiplies to create that number. This coloring scheme is great for a few reasons. First of all, it helps your kids practice their multiplication facts. What is 7*9? Just look for the number with one purple section and two green sections! But beyond that, it clues your child into one of the most important ideas in all of arithmetic; the idea that all whole numbers can be written as the product of prime numbers. This is an idea so important that it is known as the Fundamental Theorem of Arithmetic and it was proven by Euclid all the way back in ancient Greece! I'm not saying your kid is going to turn into a mini-Euclid, just by playing Prime Climb. But I bet they notice that each number has its own color coding, and that no two numbers have the same color code. That's enough for an 8 year old. The great joy of the game is the creativity that it allows your child to express with her mathematical ideas. Every roll is a chance to ask: "What ways can you use the dice you just rolled?" The temptation is to always add and multiply. After all, you want to move up the number line, not down. But there might be times when a timely subtraction is just the trick! What if you are on space 27 and you roll a 3 and a 4. You could add 3 and 4, getting up to 34. Or, you could subtract 3 to get down to 24 and then multiply by 4 all the way up to 96! What an elegant move. The more you can prompt your child to find those moves, the better. Speaking of 24, you can always ask questions that get kids thinking about multiplication. The color scheme is your friend here. You can ask: "What numbers multiply to 24? How can you use the colors of 24 to check your answers?" If your child is struggling with multiplication, this is a great way to reverse the common flash card problems and get your child to find pairs of factors that multiply to a specific number. 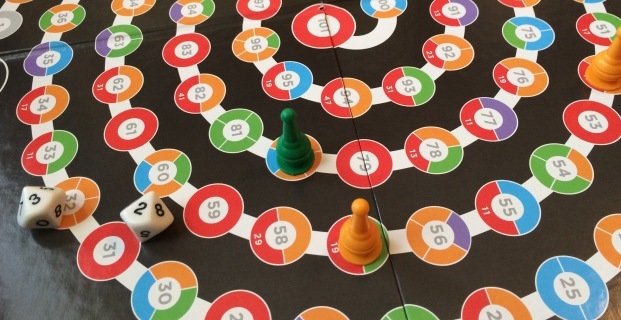 And the handy multiplication chart that comes with the game is a fantastic resource for kids who need to see more connections between the numbers the multiply and the products that arise. Frankly, I think this image should be in every classroom from 3rd grade up to 12th. Even teenagers have a lot to gain from looking into the patterns in the colors of this chart. For example, did you notice that there is no red anywhere on this table? Why is that? Lastly, on your own turn you can always brainstorm out loud about your own options. "I want to get to that 37, but I'm back here on 15 with a 7 and a 2. How could I move there?" You are, effectively, giving your kid a little math quiz. But they won't see it that way. They'll see it, rightfully, as a chance to get better at this game. 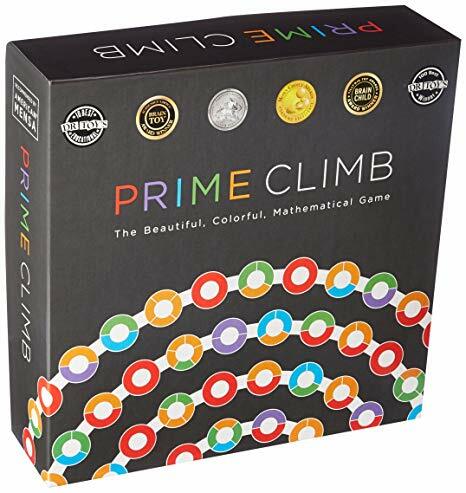 Based on the success of Prime Climb with my 8th graders, I'm going to bring it out with my friends the next time we play games. And I can't wait until a couple years from now when my kids, freshly multiplying, can sit down and play with me.